Britain's Corie Mapp won overall Para-bobsleigh World Cup bronze with a sixth-place finish in the final race of the season in St Moritz. He finished eighth in the first race in the Swiss resort on Thursday, with both races doubling as the European Championships, in which he placed fifth. Mapp, 40, finishes the World Cup season on 868 points, 210 behind Canadian gold medallist Lonnie Bissonnette. Austria's Andreas Kapfinger won silver. 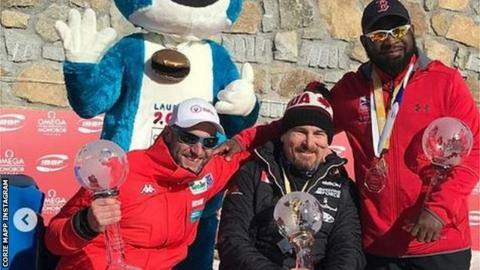 Mapp, who lost both legs in an explosion while serving in Afghanistan in 2010, won gold in the inaugural World Cup Para-bobsleigh race in 2015 and sealed the World Cup title last year with four wins. The sport will not be part of the programme for the 2022 Winter Paralympics after the International Paralympic Committee said last year that it had failed to meet the criteria for admission. Inspired to try a new sport? Find out how to get into disability sport with our special guide. A list of the key dates for 2019. Listen to Baroness Grey-Thompson explain how the different Paralympic classifications work in just 90 seconds.